RENEWAL/REPLACEMENT OF RETIREE AND DEPENDENT ID CARDS ARE ACCOMPLISHED VIA SELF-SEVICE KIOSKS LOCATED AT THE MPF AND MDG. NOTICE: Making a copy of your Military ID card is NOT authorized and is a crime! If a copy of your Military Id card is discovered it will be confiscated & you will be subject to fine and/or imprisonment. The MPF Customer Support Section (DEERS/ID CARDS) is open 8 am - 3 pm Monday thru Friday. 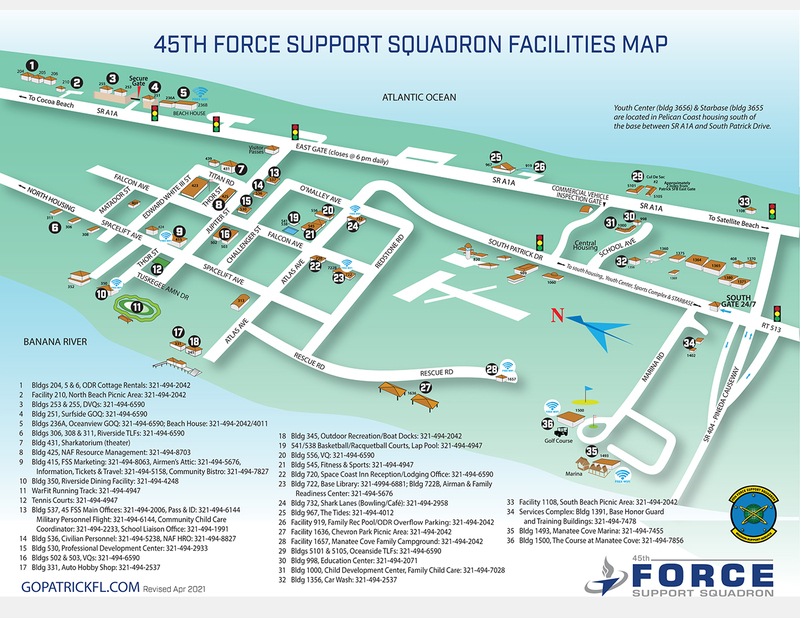 The MPF is located at 620 O'Malley Rd, bldg 537, rm 101, Patrick AFB FL 32925. The MPF will be closed on the third (3rd) Friday of each month as well as all Federal Holidays. NOTICE: DO NOT submit ID card applications via AMRDEC until further notice. NOTE: Dependents who possess a military-affiliated email address may send all documents in step 3 directly to custrsvc@us.af.mil. In the subject line, type "e-ID Card Renewal". Please complete steps 1 - 2 first. Two forms of unexpired identification. Names on both forms of ID must match. Two forms are required for anyone 18 years of age and older. One form of which must be a current photo ID. CHILDREN under 18 years of age require only one form of ID. (ex. SSAN card, Birth Certificate or current military ID card). Names on both forms of ID must match exactly. CAC, Widows, 100% DAV and Initial DEERS enrollment are walk-in services ONLY! Please see options below for our additional services. NOTE: THIS SITE IS NOT FOR PASSPORTS. If you require a passport appointment, email the passport agents at 45fsspassports@us.af.mil or call 321-494-9024/2330/4268. Other locations for ID cards include: NRC Orlando (407) 240-5939, NAWC Orlando (407)-240-5939, NMWR Miami (305) 293-3778, or to find the site near you go to RAPIDS Site Locator. In the event you have any questions or concerns, contact the MPF Customer Support at (321) 494-6144. Thank you for your cooperation.